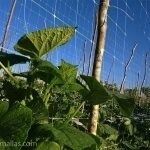 Increase profitability of your Cucumber Crop using trellis netting as plant support. 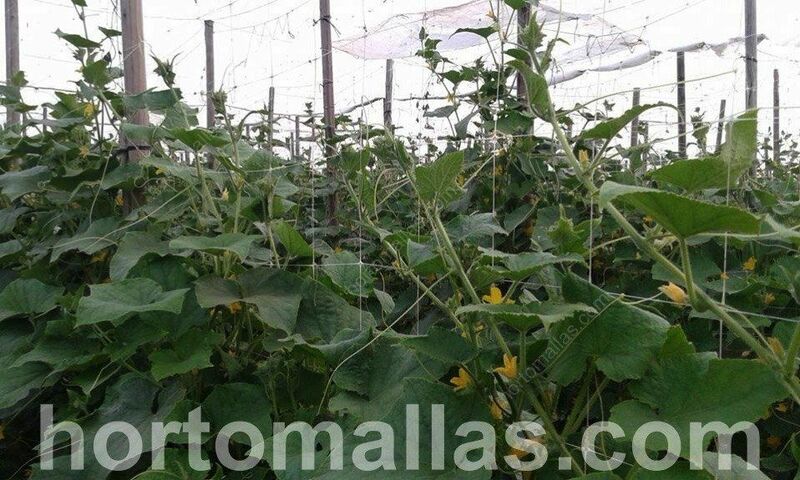 How to improve a plantation´s phytosanitary condition and increase yields of a cucumber crop? 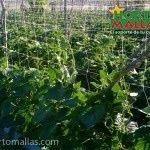 Tutoring cucumber crop with trellis net yields greater vegetable production than using traditional agricultural raffia, regarding costs, workers and profit. 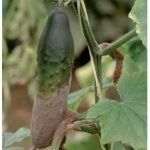 This vegetable is highly consumed by the population both as a fresh vegetable and industrialized as a pickle, being a production alternative for farmers both for domestic markets and for exports. This is why if we want to ensure a competitive production we must use methods that make handling the cucumber crops a easier task. 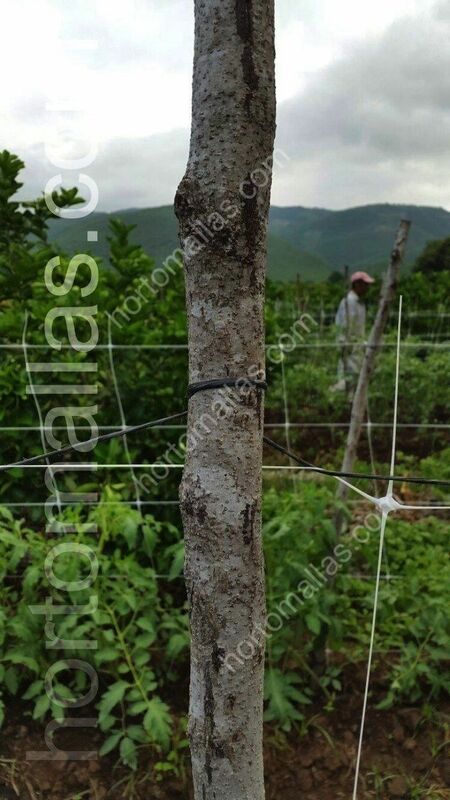 Gherkin fruit affected by Botrytis cinerea, a better tutoring system would have prevented it. 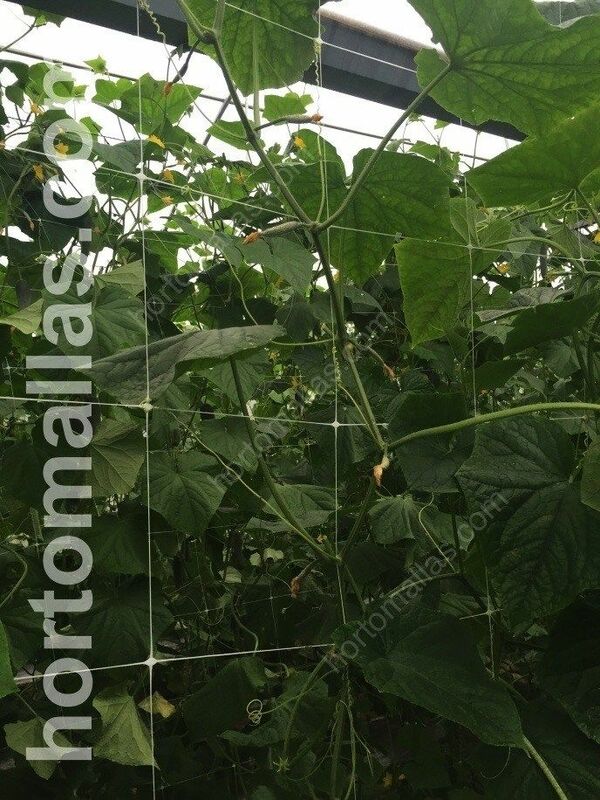 The cucumber plant is a climbing vegetable that needs 6 hours of sun light per day for its full development, using trellis nets we optimize its growing because we extend photosynthetic efficiency facilitating sunlight exposure which benefits the development of the flowering stage with more pollination possibilities. 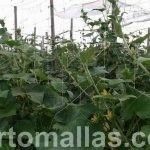 Tutoring cucumbers increases vegetable and in-between leaf aeration avoiding phytosanitary problems caused by humidity excess on the plant. 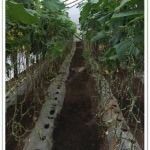 Cucumber plants are woven into the trellis net preventing flowers and fruits are in contact with the ground, and the incidence of disease or loss of fruits by abuse of farmers by passing through the groove is reduced. 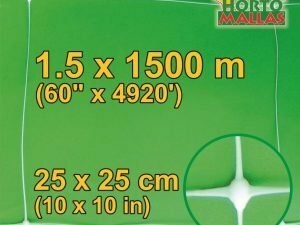 Detail of initial stage of development on cucumber plant when using HORTOMALLAS . Gherkin crop is also subject of being attacked by virosis like the mosaic viruses, these pathogens are easily transmitted mechanically by workers who come in contact with a sick plants while doing their assigned tasks, or by smoking a cigarette before entering the plantation area, because they themselves turn into agents or vectors for mechanical pathogen transmission. 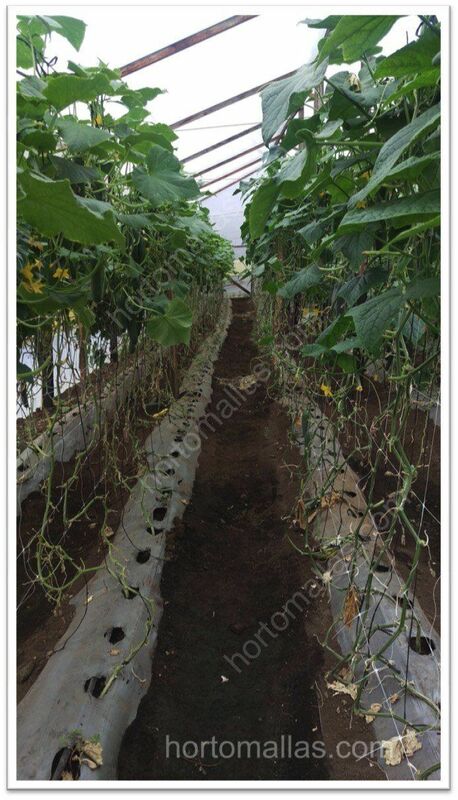 Besides decreasing in productivity due to virus and bacteria transmitted during manual tutoring using raffia twine, we have to consider that cucumber plant decreases production under mechanical stress during tutoring and plant training and this may result in less tonnage of cucumbers per hectare for each growing cycle. 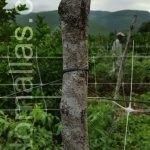 This is a detail of how the trellis net is tied to the post, same applies for gherkin crop. 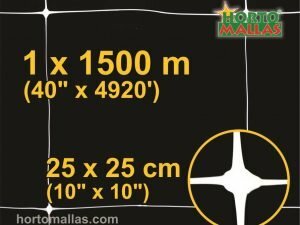 Regardless of the kind and variety of the cucumber seed or genetics used, HORTOMALLAS is essential to achieve maximum cucumber production and allow spectacular harvesting results. 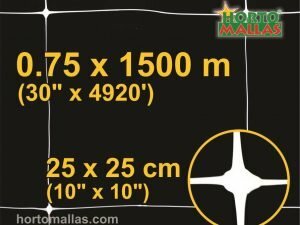 How HORTOMALLAS uses gherkins´ natural tendrils ability to vertically guide a plant upwards. 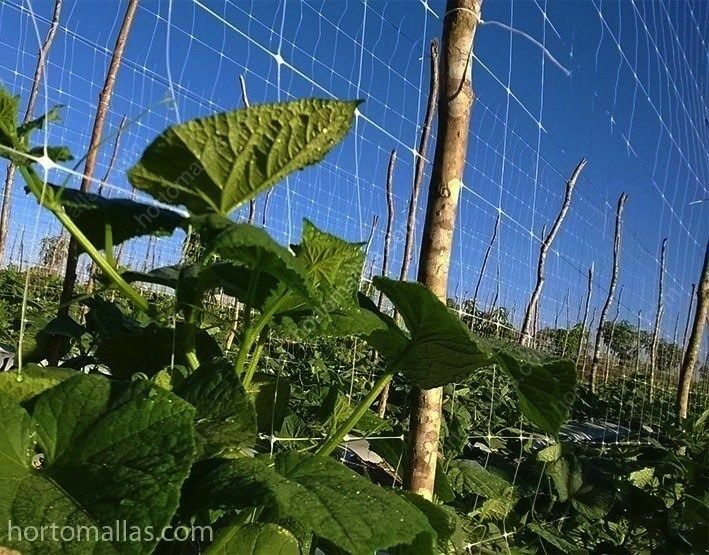 Climbing guides (tendrils) attach naturally to the HORTOMALLAS trellis structure. 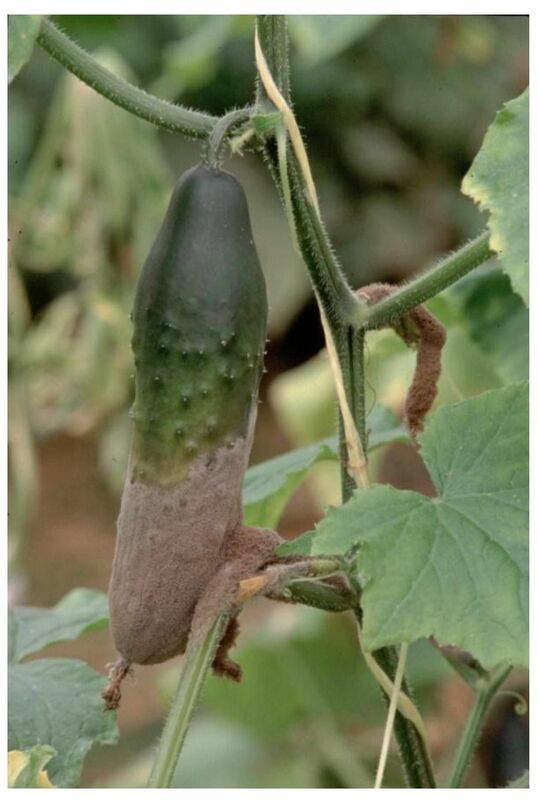 Cucumber plant like other cucurbits use guides or tendrils that as the plant grows, tend to find for support structure to latch on to, in nature this point or support may be a bush or a cane on which the plant may stay vertically avoiding fruits and leaves from suffering from pathogens caused by humidity in excess. If we were able to watch a fast motion tendrils movement, we could observe how they move in circles until they find static and firm support. Once they find it cucumber tendril starts to embrace creating a spiral. 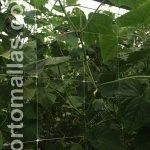 HORTOMALLAS´ function is being this support and letting the gherkin plant tie to the trellises formed by netting.